Llamas and alpacas (camelids) were a subsistence and economic mainstay of Middle Horizon (AD 600-1000) and more recent cultures in the Peruvian Andes. However, despite their economic and cultural importance, prehistoric foddering practices and the locations of pasturelands are not well known. 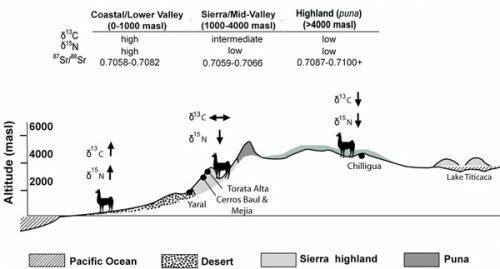 In particular, it is debated whether llamas and alpacas were herded primarily in high elevation habitats (>3500 masl) as they are today, or whether local herds were also maintained at lower elevation mid-valley and coastal locations. One of the few ways we can investigate this question is through chemical signatures preserved in ancient llama and alpaca bones, which record past diet, climate, and where an animal lived. For her MA thesis, Erin Thornton and her collaborators (Susan deFrance, Michael Moseley and Patrick Ryan Williams) tested the chemical signatures in ancient llama and alpaca bones from southern Peru. They found evidence supporting camelid herding outside of the highlands, and further used the data to investigate ancient trade and tribute patterns (Thornton et al. 2011, IJOA). Thornton and deFrance are currently expanding upon this pilot study through funding obtained from the National Science Foundation (PI: Susan deFrance). This research will contribute to our understanding of prehistoric land use, animal management, and trade and tribute relationships between coastal and highland settlements.